This interesting and uncommon name is of Anglo-Saxon origin, and is a locational surname deriving from places called Halwell and Halwill in Devonshire, or from Holwell, the name of places in Dorset and Leicestershire. Halwall near Totnes in Devon is recorded in the Episcopal Registers of the county of 1259 as "Halgevelle", and Halwill, near Holsworthy, is "Halgewilla" in the Domesday Book of 1086, and Haliwill" in the 1228 Feet of Fines. The place called Holiwell in Dorset near Broadway is recorded as "Halegewella" in Domesday, and as "Halghwell" in 1307, while Holwell in Leicestershire is "Holewelle" in Domesday. The first three of these placenames share the same meaning and derivation, which is "the holy spring or stream", from the Olde English pre 7th Century "halig", holy, and "well(a)", well, spring, steam; many springs were dedicated to saints in medieval times, although this practice was often a Christian continuance of an earlier pagan belief. 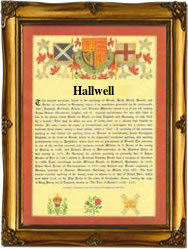 Howell in Leicestershire is "a stream in a deep valley", from the Olde English "holh", hollow, and "well(a)", as before. The modern surnames from these placenames include Halliwell, Hall(a)well, Hallewell and Al(l)well, and the following are examples from Church Registers: the christening of Willim, son of John Allwell, at Castle Donnington, Leicestershire, on August 1st 1564, and the marriage of Maude Allwell and Robert Stroode on June 22nd 1600, at Stratton with Grimstone in Dorset. The Al(l)well Coat of Arms is a black pile on a silver shield, over all a chevron counterchanged. The first recorded spelling of the family name is shown to be that of Osbert de Haliwell, which was dated 1200, in the "Pipe Rolls of Suffolk", during the reign of King John, known as "Lackland", 1199 - 1216. Surnames became necessary when governments introduced personal taxation. In England this was known as Poll Tax. Throughout the centuries, surnames in every country have continued to "develop" often leading to astonishing variants of the original spelling.